This module is specially for Toyota radio. 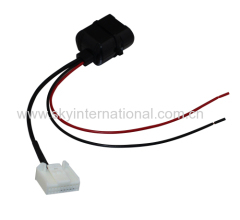 Just plug the connector into the back of the radio,and connect the two wires to 12V power. Connect your phone or mp3 or pad with bluetooth to the module. Pls make sure there is AUX button in front of your panel before purchasing!